When you put three Vacheron Constantin master watchmakers to work on a project for eight years, you can bet the result will be complicated. 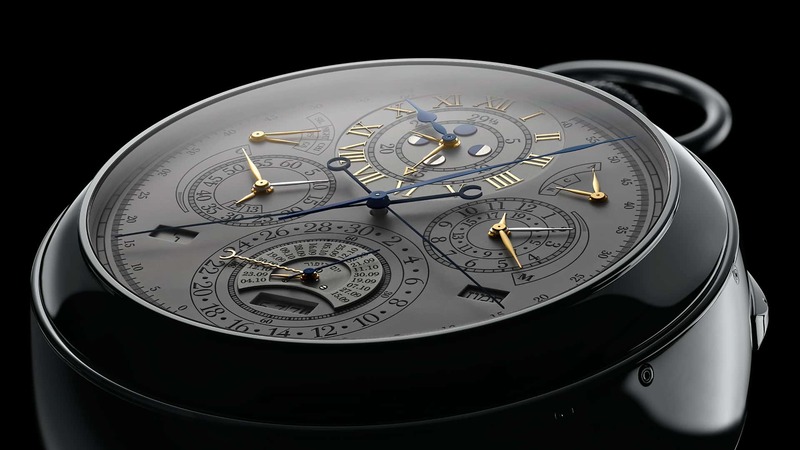 Last year, TimeCaptain did an intro into watch complications, where he mentions the Franck Muller Aeternitas Mega 4 as the most complicated watch, featuring 36 complications. 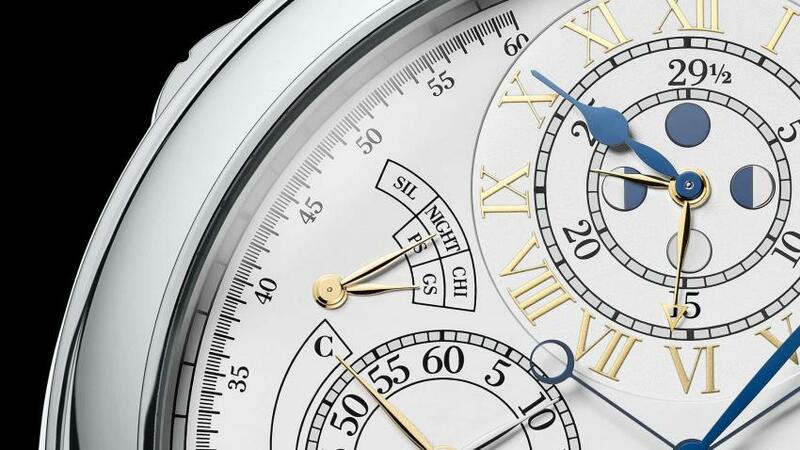 The Vacheron Constantin Reference 57260 with its 57 complications, surpasses by far any super-complicated watch seen before. 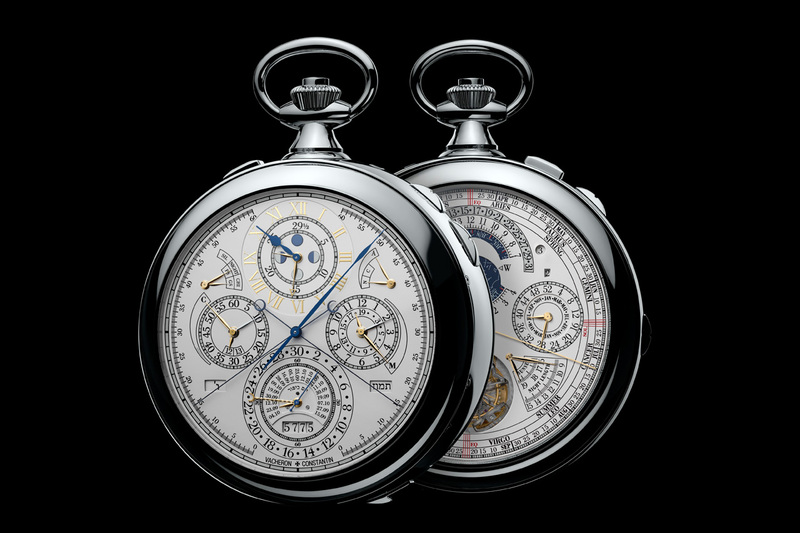 Not just because of the sheer number of features, but also because of it introduces unique complications designed and developed for this timepiece, such as the use of multiple calendars and of a double retrograde rattrapante chronograph. To fit everything together, even the more “trivial” complications had to be reinterpreted and redesigned, for the finished watch to be harmonious as a whole. The case, crafted from 18k white gold is 98 mm in diameter and it’s 50’55 mm in thickness, has a three-position winding crown with corresponding indication window on the case band to show the position of the crown during winding or setting. Each side of the watch has a dial made of solid silver, while the rotating discs for the displays are made of aluminium so as to be light and require less energy to move. 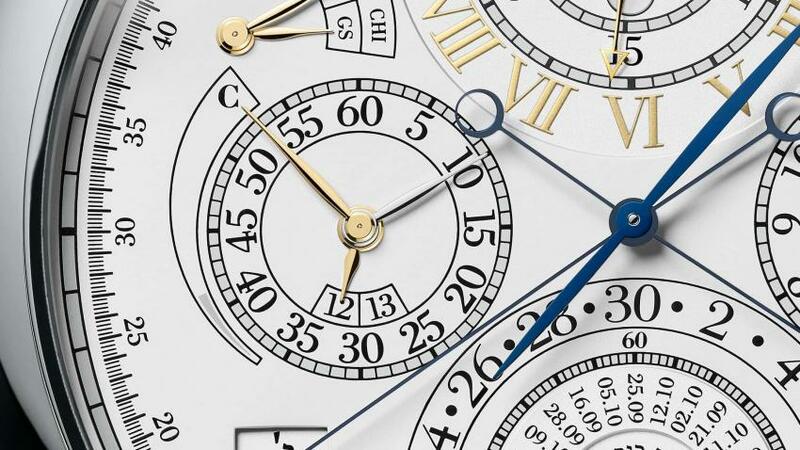 The meantime dial is of regulator style, displaying the hours, minutes and seconds on separate chapter rings, a design derived from precision regulator clocks used in observatories and laboratories. Let’s take a look at some of the complications present on this watch. Besides a Gregorian perpetual calendar, the Vacheron Constantin 57260 also features a 19-year cycle Hebrew Perpetual Calendar. Due to the long-term changing cycles of the Hebraic calendar and its difference from the Gregorian calendar, this complication has never been attempted before. It required solving a highly-complicated mathematical problem combining both the lunar months and the solar year, and managing to find a way to display it in an easy and elegant way. The Hebraic perpetual calendar works on the principle of the 19-year Metonic cycle because 19 years is almost the multiple of the solar year and lunar month over that period. On this watch the Metonic cycle (also called Golden number) is displayed as a sector at 3 o’clock concentric with the chronograph hour register. Yom Kippur indicated in the Gregorian Calendar each year, represented by the corresponding retrograde hand at 6 o’clock, which returns to its starting point every 19 years, at which time the sector is replaced for another for each of the 19 years cycles. To keep the 12-month lunar year in pace with the solar year, a 13th leap-month is added seven times during the 19-year cycle. The watch will show its owner if the current year is a a 12 or 13-month year via an indicator hand and 12/13 display situated concentric with the chronograph minute register and counter hand in the 9 o’clock position. This is the first watch have a rattrapante chronograph with double retrograde action. It is read as any other split second chronograph, what sets it apart is the fact that the two hands never meet. They operate on two separate scales on the opposing sides of the dial. 1. 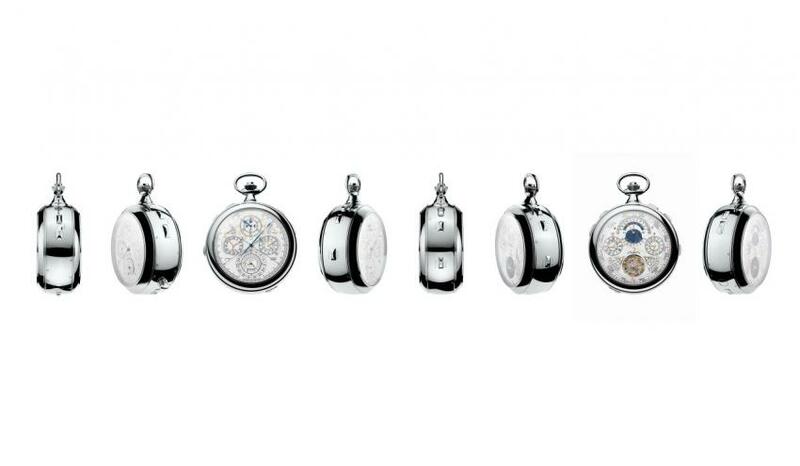 Striking — the watch chimes at each passing quarter hour in the same way as the “Big Ben” in London. 3. Silence — the chiming is switched of when it is not desired. Not exactly a complication, but the tourbillon cage on this piece is spectacular. 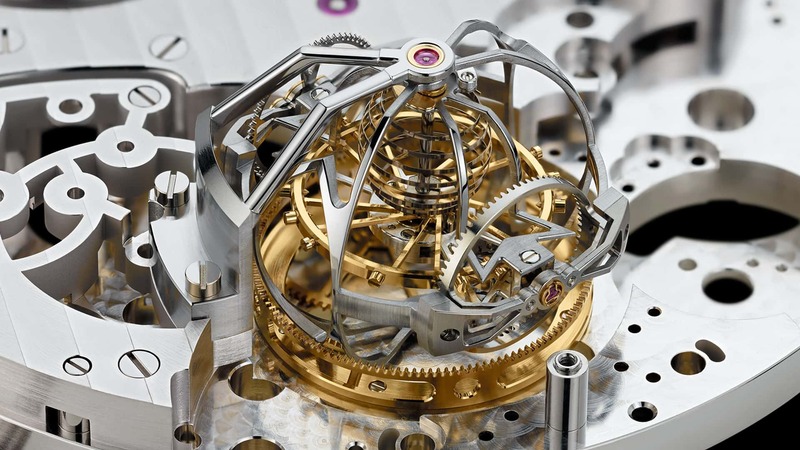 They named it Armillary Sphere Tourbillon, because visually it is reminiscent of the circles and rings of the scientific instrument known as the armillary sphere. Placed in the second dial, next to the astronomical functions, it suggests the apparent movement of the stars, the Sun and the ecliptic around the earth. 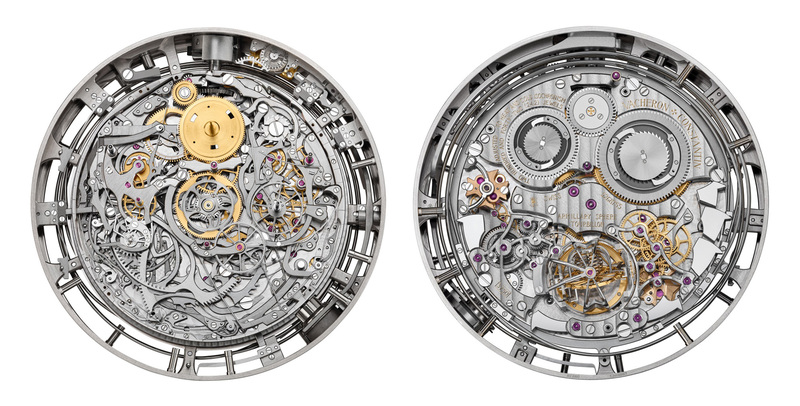 The frame of the cage itself, made of ultra-light aluminium, incorporates the Vacheron Constantin company symbol, the Maltese Cross, which becomes fully visible once every 15 seconds, during the tourbillon’s rotation. We are just scratching the surface, there are many other interesting facts to be discovered about this unique watch that Vacheron Constantin will be proud to present to you through the Reference 57260 mini-site. It is an interactive way of going through all the 57 complications equipping this masterpiece.